What beautiful plants they were—four Burpee Bush Champion cucumber vines. Their dark green leaves were so healthy I sometimes paused just to admire them—and the brilliant yellow blossoms too. Soon I was picking beautiful cukes—then bucketfuls of cukes. We ate cukes—gave cukes to our daughter, friends, and neighbors. About the first week of August I noticed yellowish spots on several of the largest leaves. I took a photo on August 6. A day or so later several leaves began to curl at their edges and turn brown. By August 12 the plants were essentially dead, except for a few young leaves at the ends of vines and for scores of yellow blossoms that never would be cucumbers. On August 16 I told my story and sent two photos to the experts at the Home & Garden Information Center of the University of Maryland Extension via the HGIC website. What had happened to my cukes? What could I have done? What do you advise for next year? A reply came the next day. “It might be downy mildew, especially since it moved so fast…. [B]ring us a sample if you still have any green material showing symptoms.” Since I had pulled up the pitiful remains of the four Bush Champions that morning, I went out to check for samples, removed two young leaves with yellowish spots, laid them flat in a plastic bag, and took them to the HGIC office. A plant disease expert examined them the next morning but didn’t find downy mildew spores, perhaps, I suspect, because the only leaves I had were so young. But the feeling was that downy mildew may have killed my cukes. 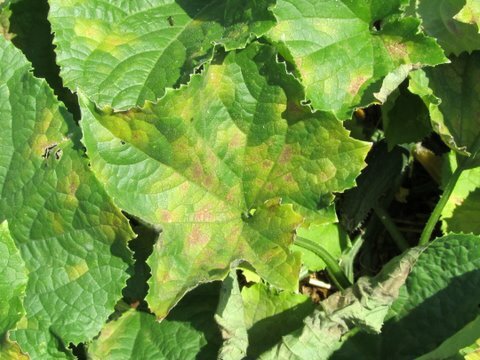 The circumstantial evidence: the speed of plant decline from first symptom; the yellow spots as first symptom; confirmed downy mildew was killing cukes in other places in the county at the same time; and August and September is prime time for the disease to strike. I’m not happy that my cukes are done for this year. But I’m already planning on following the HGIC suggestion that I select seed of a variety resistant to downy mildew next year. HGIC also said I could compost the dead plants, since downy mildew doesn’t overwinter in Maryland—and added that the spores probably arrived here this year via wind from the South or from Canada. I’ll have to look for indications of downy mildew resistance in seed catalogs. HGIC recommended I check the cucumber section of the Cornell University Extension website, which contains lists more than 5,000 vegetable varieties resistant to a variety of diseases. What could I have done to save my Bush Champions? I’ll be researching resistant varieties this winter—perhaps between shifts running my snowblower. And snow isn’t a bad thought in Summer 2010, when we’ve already had 54 days of temperatures of 90° F. or more. Where are my memories of last winter’s 80 inches of snow? 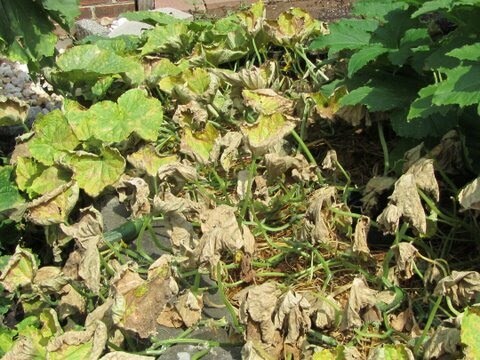 If you’ve grappled with downy mildew in your garden and have found resistant cucumber varieties, please post a Comment with your recommendations. Additional information: The Plant Diagnostics tab at the University of Maryland Extension’s HGIC website contains additional information about downy mildew, including 12 tips to help keep it out of your garden. To go there, CLICK HERE. To begin exploring Cornell University Extension’s “Vegetable Varieties for Gardeners,” CLICK HERE.